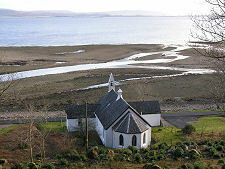 The name Kingairloch features twice on Ordnance Survey maps. It appears in small lettering to represent the tiny settlement on the north side of Loch a' Choire near Kingairloch House, and in very much larger lettering covering some eight miles of the eastern shore of Morvern overlooking Loch Linnhe. 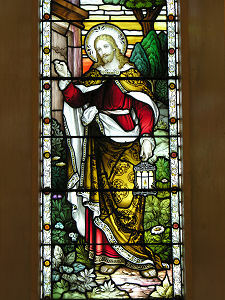 We use it here to represent the settlements of Kingairloch itself, and neighbouring Camasnacroise, home to Kingairloch Church. Kingairloch is a remarkably remote place. The nearest settlement is Strontian, some six miles to the north west as the crow flies, but well over twice that far by road. And the only roads in or out are single track. 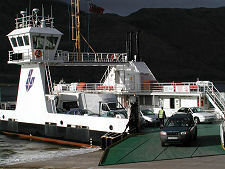 One runs for eight miles north along the shore of Loch Linnhe to join the A861 six miles south west of the Corran Ferry. The other leads for five miles west past Loch Uisge to join the A884, 10 miles north of Lochaline. 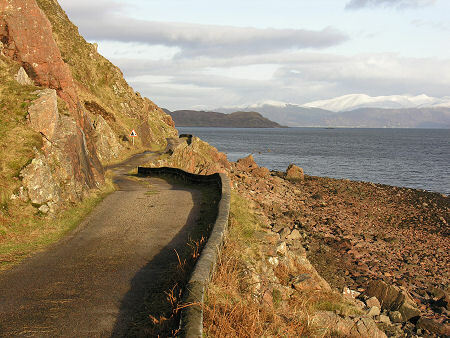 This part of Morvern was the traditional home of the Macleans of Kingairloch. From the late 1400s their main base was at Glensanda Castle, on the shore of Loch Linnhe four miles south west of Kingairloch. They seem to have given this up in about 1780 in favour of a more modern and better sheltered house known as Connach, built at the head of Loch a' Choire. 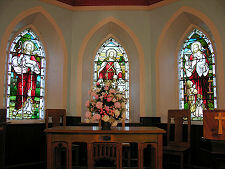 In 1800 the Macleans sold their Kingairloch estate to an English landowner, James Forbes, and emigrated to Canada. 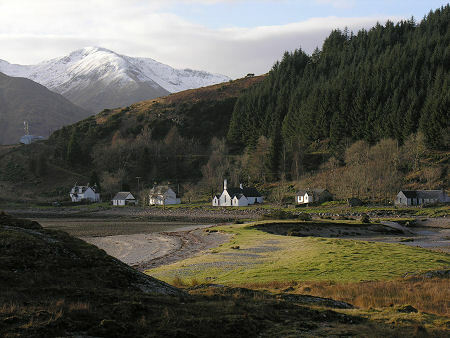 Forbes had the existing house at Connach extended to become the first Kingairloch House. In 1888 the estate was purchased by John Bell Sherriff, a Falkirk industrialist, who extended the house and built the corrugated iron ballroom which still survives. The Kingairloch and Glensanda Estates were sold again in 1902, this time to the English cotton magnate George Herbert Strutt. He further expanded Kingairloch House, turning it into a grand Baronial shooting lodge. In the early 1960s the Strutts reversed the process, dramatically reducing Kingairloch House in size, presumably to ensure its continued relevance as a shooting lodge. Perhaps the best known member of the family was Patricia Strutt, who married the heir to the estates, Arthur Strutt, in 1930. A enthusiastic deer stalker, she shot some 2,000 stags over the following seven decades, becoming known as the "Killer Lady of Kingairloch". She only stopped shooting a year before her death, at the age of 89, in 2000. 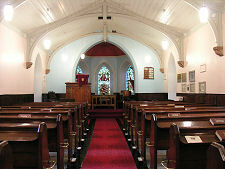 The second most notable building in Kingairloch is the parish church, built at Camasnacroise in 1857. 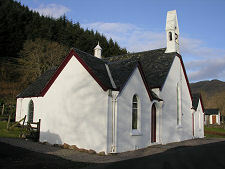 This gained an apse and stained glass windows in 1906 and must enjoy one of the most idyllic, and remote, locations of any mainland Scottish church. 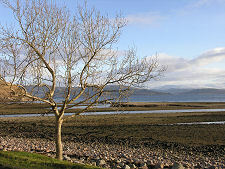 The story of Kingairloch started at Glensanda, and there is a sense in which that is its main focus today. Four miles south of Kingairloch, but invisible from it and inaccessible by any public roads, is the Glensanda superquarry. 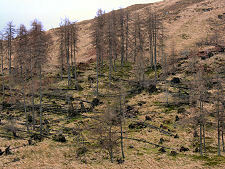 For the past two decades this has been steadily removing an entire granite mountain, Meall na Easaiche. The pulverised granite is transported along a mile of conveyor belts in tunnels to a jetty, where it is loaded directly into bulk carriers. Glensanda started operation in 1986 to provide lining material for the English half of the Channel Tunnel. At its height, two ships a day sailed from here, and they even laid out a small airstrip on the coast. Today Glensanda continues to provide high quality granite to various destinations in Europe and beyond.